Often, an enlarged lymph node is the first sign of cancer, or that cancer has come out of remission. At your next visit, ask your veterinarian to show you where these nodes are. Below, you can see the 5 major external nodes. Many people discover cancer in their pet because they say that they noticed a lump the size of a walnut on their dog or cat. Early detection is the best way to get a good treatment result, so make it a point to give your pet luxurious massages! Get your fingers right down to the skin and be aware of any lumps or bumps that shouldn't be there. This is not only an important part of your at home check up - it is also a time for bonding! Please use a harness instead of a collar! Apart from medical conditions that can result from use of a collar, it's downright rude! Just imagine being pulled around by your neck your entire life. Laryngeal paralysis (a congenital condition exascerbated by collars. Most harnesses press on the prescapular nodes. 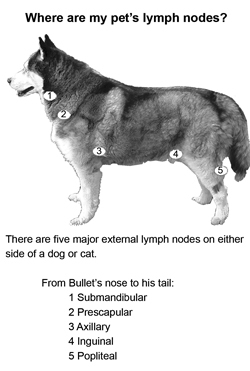 The two harnesses below do not apply pressure to any of the lymph nodes.